If you’ve ever cleaned up the wrapping paper after a major holiday, you know a thing or two about how much waste is created in giftwrapping.”But but!”–you might say, there’s something so wonderful about the presentation when it comes to gift giving, and Jennifer Playford would agree. 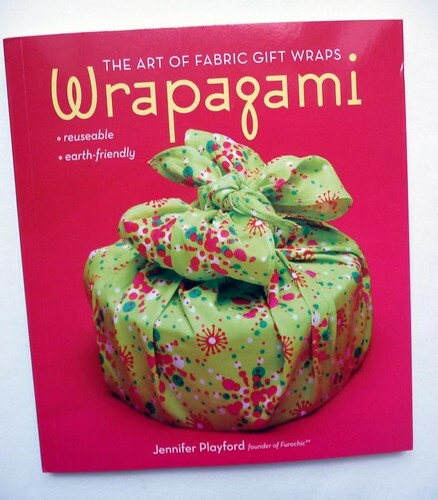 She’s the author of Wrapagami: The Art of Fabric Gift Wraps , a new book that will teach you all about wrapping your gifts with re-useable fabric. 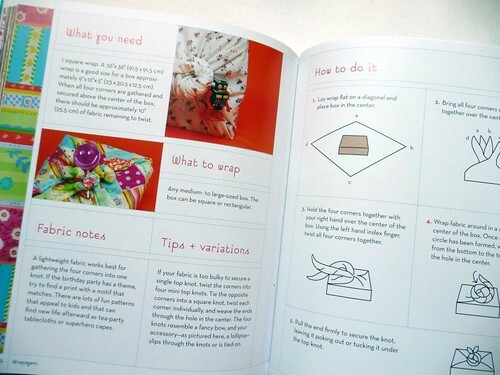 (Almost) All of the wraps in the books are secured with knots, and she guides you through each step with helpful diagrams (think origami books). She covers everything from basic shapes to wrap, such as wine bottles, books, and boxes and gives tips on variations that can make your gift unique. As a bonus, fabric wrap is much easier to use on odd shaped items that are typically hard to cover with paper. I think these ideas would work well for gifts to your sewing and quilting friends, who might have more fun with the wrap than the gift itself. 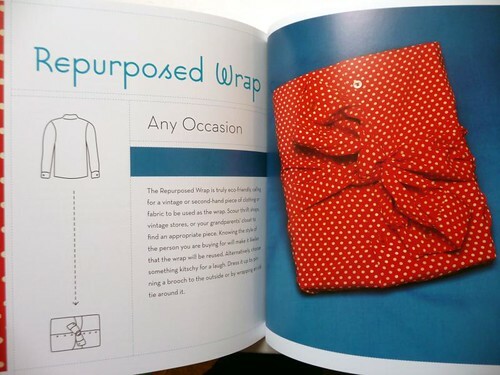 My favorite project has to be the Repurposed Wrap, where she shows you how to use an old long-sleeved dress shirt for the wrap. I have one copy of this book to give away, so please leave a comment here if you’d like to win a copy! Comments will close next Monday, September 14th at 12 pm Mountain Time. I'd love to have this. Thanks for the giveaway! i wouldn't mind winning that book! thanks for the chance!